We received the info below from our friends at beautifulcity.ca and are happy to repost here. Note the event will be moderated by Variation on Theatre #7 and Theatre Why Not Artistic Director Ravi Jain. Note that those involved in the budget process are likely sizing up this whole situation to see how much trouble it’s going to be to just sweep this under the rug. Note that if you show up you will play a small part in contributing to that assessment. Finally, please note how well the colours of the invite work with the rest of this website! The billboard tax has been passed but zero new money has been invested in beautifying or democratizing access to public spaces with art in the 2010 Budget. This goes against highly favourable public opinion polls by EKOS (2009) Environics (2007) and Pollara (2005) and a 4500 person petition, 60 endorsements by organizations and reams of city plans to build a successful Toronto for the long-term. Along with the Mayor, city councillors from across the political spectrum have also been very supportive of a billboard tax to fund art in committee, council and the press. Similarly, public consultations, staff and consultant’s reports stated that the purpose of the tax was to support arts and city beautification projects. We are not really sure what happened, however the budget has not passed yet. It’s time to get a bit pissed — then get smart and help correct this mistake by coming to the town hall. It worked to get the tax. It might just work to take it back! 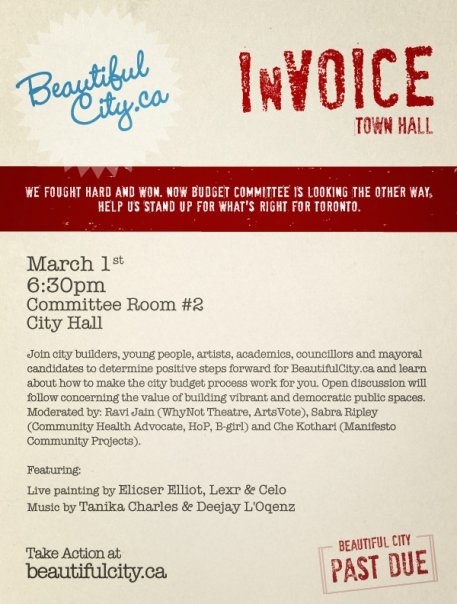 Filed under arts funding cuts, beautifulcity.ca.